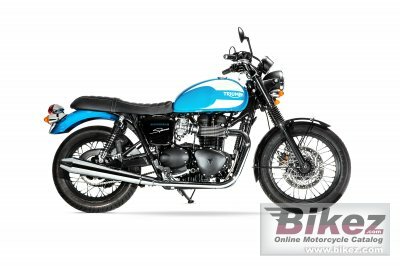 2015 Triumph Bonneville Spirit. Picture credits - Triumph. Submit more pictures. The most striking feature is the unique Spirit Blue / New England White paint scheme which adorns the fuel tank and rear mudguard. White stitching has been used to decorate the part-textured seat cover, and contrasts with the Jet Black paint that has been applied to the side panel and front mudguard. In favour of the traditional chrome Triumph badge the latest Triumph script has been used on the fuel tank to maintain to the fresh contemporary feel. Comments: Special Edition styled to celebrate the spirit of customisation. Ask questions Join the 15 Triumph Bonneville Spirit discussion group or the general Triumph discussion group. Bikez.com has a discussion group for every motorcycle. Here you may find answers to common questions about the model. If you do not find what you are looking for, you can ask questions. Try out the 2015 Triumph Bonneville Spirit discussion forum. You can sign up for e-mail notifications when other users answer you. If you have information about any technical issue related to this motorcycle, please leave a comment for other riders.